In this page, you’ll find how this specific lesson plan, Crafting Calculator, is aligned to the Common Core Mathematics Standards organized by grade level, domain, and standard ID with in-depth explanations and examples. CCSS.MATH.CONTENT.3.OA.A.2: When making planks and sticks from trees in Minecraft, students can explain how much of each item they need to craft other items. For example, it takes 2 planks to make 4 sticks. From there, they can make their own equations (Sticks=2*Planks) and go into ratios (2:1). CCSS.MATH.CONTENT.3.OA.A.4: When calculating the amount of planks and sticks they need for their tools, students will need to use multiplication and find the product. When determining the amount of wood needed, they will calculate the quotient. CCSS.MATH.CONTENT.3.OA.C.7: This lesson involves students multiplying and dividing within 100, developing their knowledge of the relationship between multiplication and division. For example, students may say that they need 2 groups of 12 sticks, which equals 24 sticks total (2 x 12 = 24). CCSS.MATH.CONTENT.3.OA.D.8: Students will use addition, multiplication, and division in this lesson plan. They will also be exposed to remainders and the concept of rounding up. Through crafting tools, students will create and solve their own math problems using multiplication and division. CCSS.MATH.CONTENT.4.OA.A.3: In the Crafting Calculator lesson plan, students will divide and deal with remainders when calculating how much wood they need to make their tools. Students will also realize they need to round up since it’s not possible to collect a fraction of a wood block. CCSS.MATH.CONTENT.5.OA.A.1: Students are using addition, multiplication, and division to solve the problem of how many materials they will need to craft their materials. They must calculate using the four operations and deal with remainders of quotients. In Crafting Calulcator, students will use all four operations (addition, subtraction, multiplication, division) throughout the lesson to calculate how many materials they’ll need to mine. 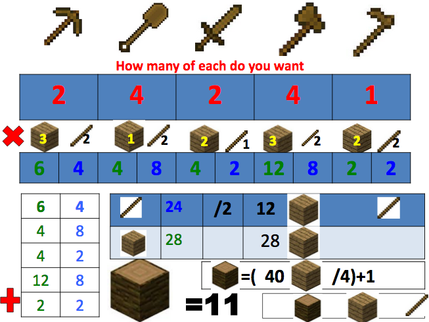 CCSS.MATH.CONTENT.6.RP.A.1: Crafting the various tools in Minecraft involves different amounts of sticks and planks. The lesson plan Crafting Calculator uses this system to have students discuss these amounts in terms of ratios. For example, crafting a shovel needs two sticks and one plank, which is a ratio of 2:1. These numbers can grow more complex as students begin to calculate amounts for numerous tools (e.g. two shovels, a sword, and three axes). 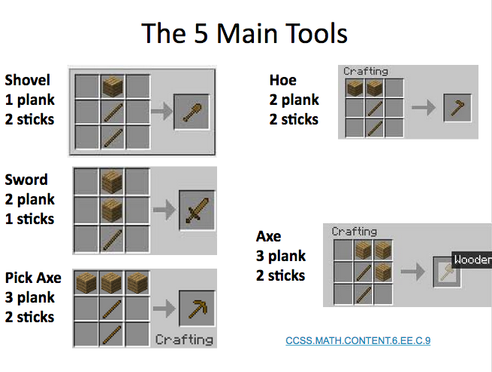 CCSS.MATH.CONTENT.6.EE.C.9: When making the five main tools in Minecraft, students will have to develop an algorithm to determine the number of wood, planks, and sticks needed to craft X amount of tools.